Today we’d like to introduce you to Cara H. Cadwallader. Cara, let’s start with your story. We’d love to hear how you got started and how the journey has been so far. When my son was a few months old, I started holding a weekly, postpartum support circle at our local birth center. American motherhood can be an extremely isolating journey. Yet, I found something deeply healing in sharing a regular meeting time with other women and their infants. Our birth center, however, didn’t have the infrastructure to support childcare for the older children of postpartum mothers. Thus, I wanted to create a space where Mamas could get their needs – for emotional and professional support – met, while their toddlers safely played elsewhere. Our co-op began in the fall of 2016. After spending that summer watching up to five children, here at my home, I wanted to maintain a continuity of regular, social interaction for my then, almost 2-year old. During our first year, our cooperative mainly looked like a playgroup. 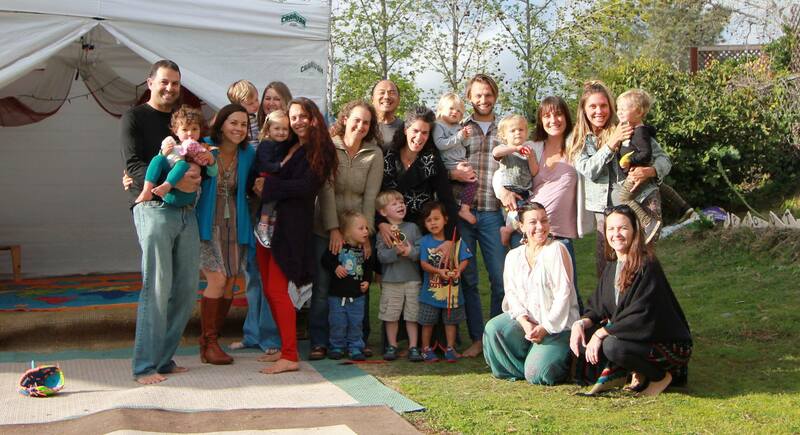 Mamas took turns facilitating activities for everyone to enjoy – like making leaf crowns, doing kids yoga, playing with a parachute, and more. Meanwhile, the Papas helped to build outdoor infrastructure like benches for the adults to sit on and an outdoor stage. Children need very little to get their needs met – give them some yard space with sticks and stones and they are good to go. Most mothers, on the other hand, have been raised to prioritize ourselves last. Thus, we need a lot of time for self-care and inner reflection. In order to receive this, though, we must feel confident that our children are being mindfully tended to. I quickly realized that in order to do ‘the work’ with Mamas that I am passionate about, then someone else needed to hold a loving structure for our children. 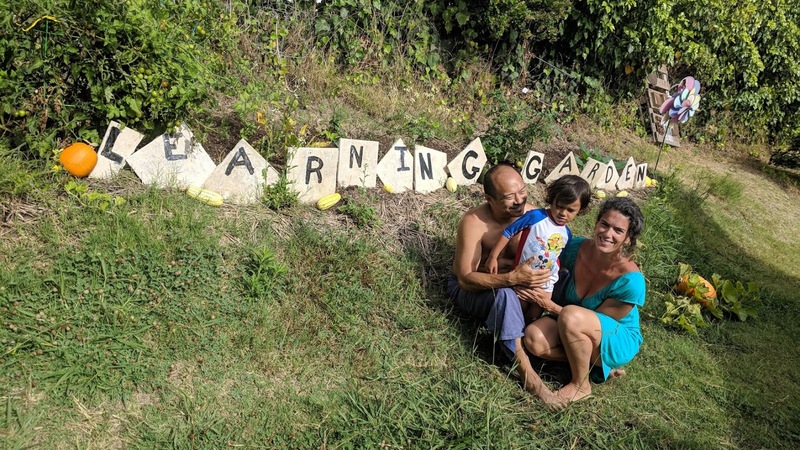 In the fall of 2017, Erika Williams came on board and we launched our “Little Sprouts Learning Garden, – where children bloom, thrive & grow.” We’ve spent the past year grounding fifteen, cooperative families into the workings of our learning garden. This month, we launched our first season of summer camps. Our intention is to expand and evolve the offerings of our co-op as our children continue to blossom. It hasn’t been a smooth road, truth be told. During our first year, we had a biting incident that became really uncomfortable amongst a small group of adults. There were also difficulties with communication, specifically about our co-op’s vision and how to grow it as well as how to collaborate with others in our community who are creating similar visions. Cooperation implies that a group of people are working together to grow a system. Yet, we started our co-op with my vision and my partner’s full support – mainly because we had the materials and resources to create a solution that we believe our community needs. In hindsight, I wish I would have inquired of the women who attended our first informational meeting what they wanted in a co-op. I now wish I would have started out creating it with a group of people. I did, however, feel pressure in getting my own needs met. My son needs regular interaction with other people, of all ages, and I need the time when he is engaged elsewhere to breathe, and check-in with myself. In other words, I need time off and he needs to play with other children! Today, we have detailed behavioral and health policies written down and handed out. We also have employees who get paid for their committed, dedicated work. Meanwhile, we continue to move towards a vision where we all work together for the greater needs of our whole. Alright – so let’s talk business. 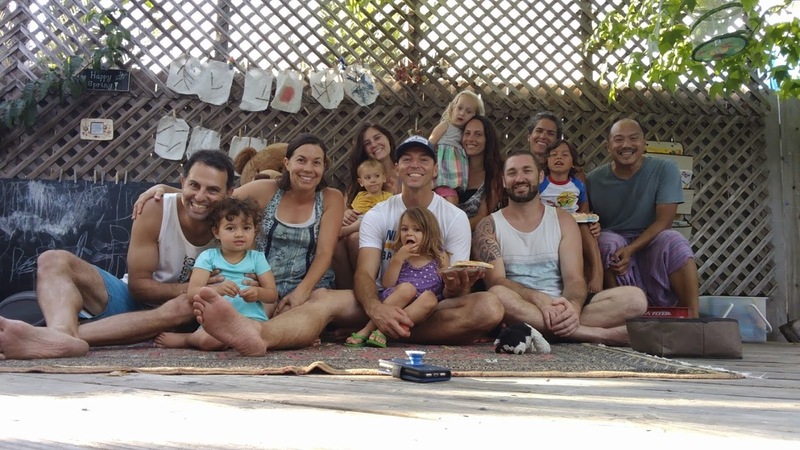 Tell us about Mama’s (& Papa’s) Cooperative Encinitas – what should we know? We are dedicated to the health and well being of mothers and their families. We do this by assisting women during their postpartum periods; by guiding women through transformative, life experiences (like pregnancy loss); and in providing a village space where women and their families can gather, connect and grow. What sets us apart from a lot of other women-focused businesses is our sustainable practices. Our outdoor infrastructure, including easels, a water table, a stage and more, was created through repurposed wood pallets. While on-site, our co-op members can learn about vermicomposting and how to create soil. They can also collect collard greens, strawberries, tomatoes and watermelons that we grow in our learning garden. 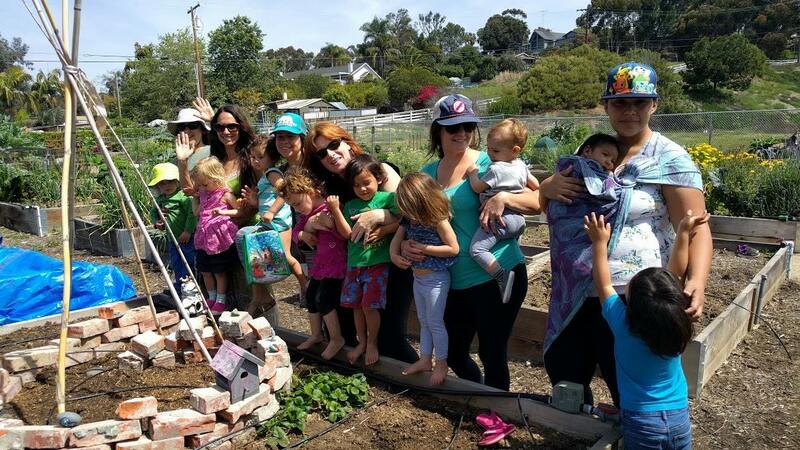 We also volunteer at the Encinitas Community Garden, where we help weed the whole garden and where we hope to grow food for our wider community. We are doing our best to learn how to love and care for ourselves, each other and our planet – and this is what we are most proud of. Our Midwife, Susan Melnikow of Tree of Life Birth Center, has been a constant mentor and advocate along the way. She has generously loaned us the key for the use of her own facility, where I once held postpartum circles and where my partner would lead a men’s group for dad’s. When I began my journey of educating women on their motherhood path, both Kimberly Ann Johnson and Amy Saloner graciously offered their time to meet with, and provide guidance for me. Erika Williams and her husband Judd Handler have been instrumental partners on this journey. As our learning garden director, Erika holds a tight, loving container that aids our children in feeling safe. Judd has spent countless hours pushing the children on the swings and playing with them in the yard. 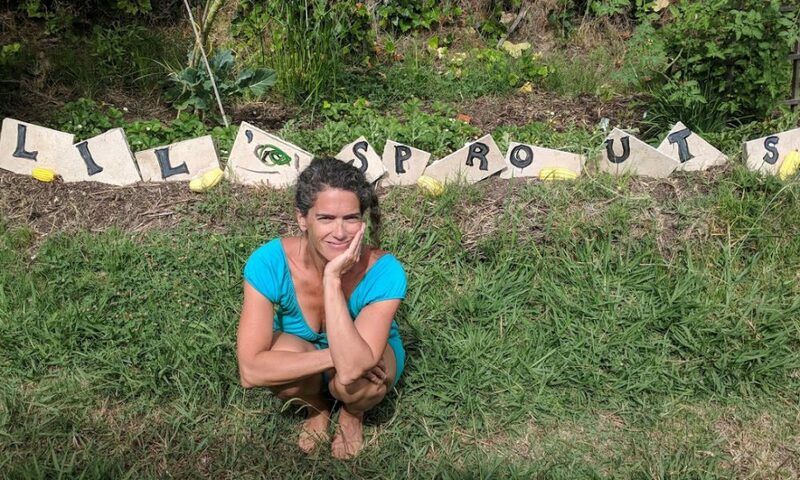 Judy Osman is our permaculture coordinator. She leads our co-op crew through nature lessons, here at the co-op as well as out on local hiking trips and at the community garden. Cara and Dave Zappasodi are also important co-op members. Cara is regularly on-hand to assist Erika in the learning garden. The kids loving having Dave around to play with. Courtney and Brant Helms are essential, too. Courtney serves as our co-op’s doctor and is regularly on-hand to administer ear seeds to our members. She also offers herbal consultations and other health counsel. Brant recently helped to design and build our living succulent wall.